Note - this article was written back in 2005, so the technology, available programs, techniques, stylstic useage, etc has changed drastically since then. I leave it here as an historical document of the time. One of the most overused buzzwords in the a cappella community is "Auto-Tune," though a great majority of people talking about it don't know exactly what it is. Widely loved and hated, sometimes within the same breath, this program (and others like it) can wield great results if used properly, or can turn your group into robots if abused. I liken it to painting your car: you can go down to the hardware store and buy a few cans of spray paint, and in less than an hour, your car is another color. The rust spots are gone, and it might be an improvement on the original ugliness, but everyone will still know you used spray paint. You can also strip the car down, prime it, apply layers of good enamel, bake it on, and buff to a high shine - much more work, but the results are worth it. Auto-Tune will work in both of these ways, depending on how much time and effort you want to put into it. 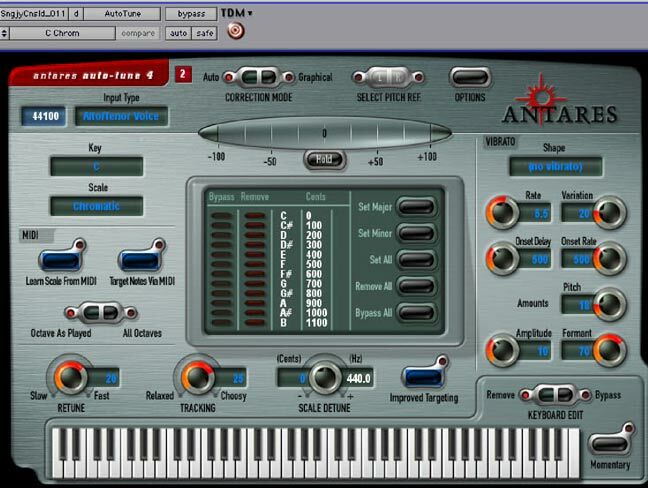 Auto-Tune has two different modes, "Auto" and "Graphical." In Auto mode, you set a scale, and the program won't let notes drift away from these pre-set grids. The problem with this is that in singing there are many inflections, stylistic scoops or bends, etc, that get caught in this web. This is also a mode you hear a lot because it's a quick cheap fix -someone was out of tune, and by stealing the other natural elements of their voice, they can quickly be back in tune. Robbing Peter to pay Paul as it were, but hoping that the problem solved was more egregious than the new problems created! It might take a listen or two to hear the fine details, but as you can hear and see, the first note bumps slightly sharp at the end, the second note starts sharp and drifts flat, the third has a wide, quick vibrato that covers nearly a whole step, and the fourth has a definite dip in the middle of the note. Taking a step back to the first picture, the non-graphical mode, audio example 2 shows how the same snippet of audio would sound in this mode. At this point, we can choose to have Auto-Tune do the work for us, do it manually, or a combination of both. 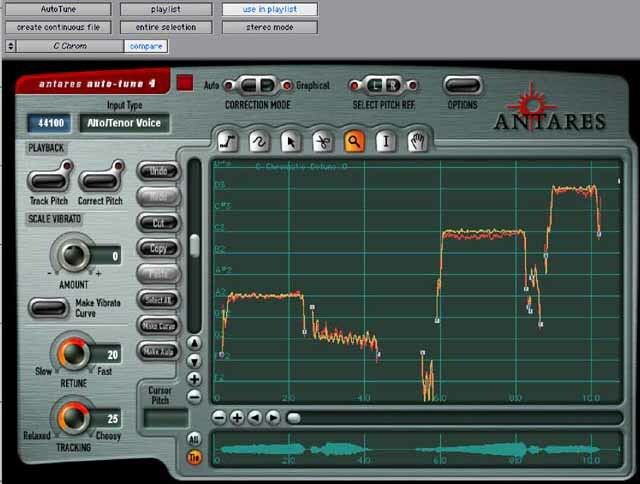 Here we have chosen to let Auto-Tune do its own correction based on the analysis. As you can see, sometimes the notes take a quick leap and dive on either end by as much as 4 semitones or more. These are the natural inflections or "scoops "in our voices. 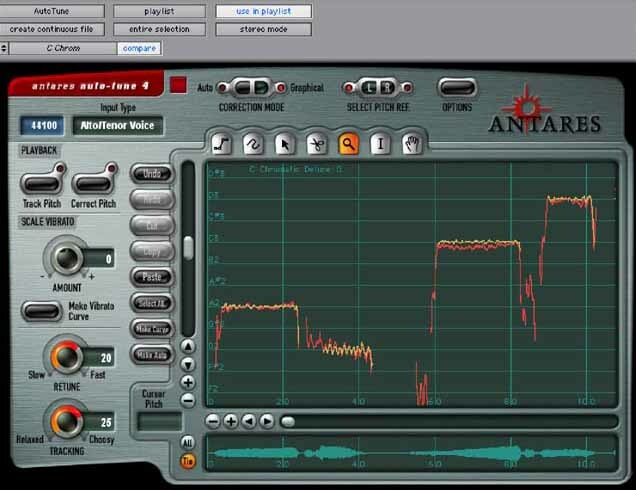 Even though it's hard to see in the example, Auto-Tune is trying to "tune" these as well, creating a very fast "stair-stepping" sound. It's very fast, though, and in the context of other music it's usually getting into the "acceptable" range. In audio example 3, since the solo voice is all we hear, it might be more apparent. At the end of this page I will also show each example in the context of the other parts. At this point we can manually remove some of the correction so the natural inflections come out more. It's the removal of these inflections that sound unnatural to our ears, so if we can leave them alone and only tune the fundamental part of the note, Auto-Tune becomes much more transparent. Not always perfect, but less detectable unless you are listening for it specifically, and listening hard at that. In figure 4, I've removed the initial correction for each note, and removed all correction for certain notes. While the second note now starts sharp, it quickly settles to pitch (but doesn't go flat anymore), but sounds pretty natural in doing so (after all, "perfect would just be weird.) The third note, since it's so quick and wavered, really wasn't helped by any correction so I removed it. 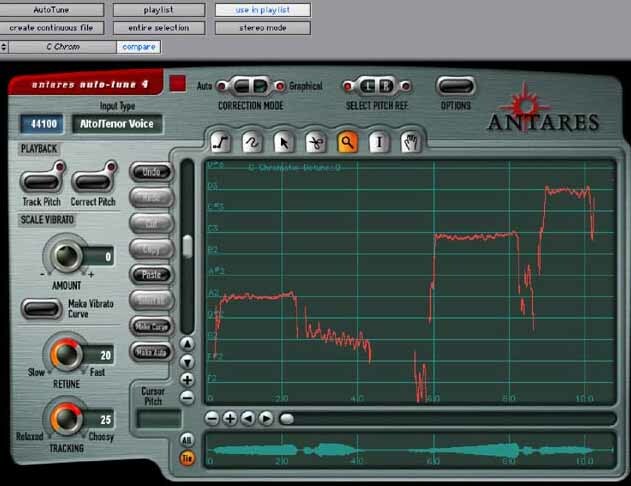 Audio example 4 shows the result of this, and now we're ready to work on the next 10 seconds of the vocal - now you can see how this would take some time!